Stockholm's Army Museum seems at first thought an unlikely place to hold an exhibition about knitting. Beyond the Home Front knitters of World War II, can yarn really be a way of stopping bombs? The current exhibition Knitting Peace by Cirkus Cirkör proposes craft as a means to quell conflict. This ambitious show combines several works: installations of knitted objects sent in by participants; tableaux featuring Cirkus Cirkör and their performers; and an exhibition about craftivism, activism x craft. Though slightly inconsistent in the material that it presented, the overall theme was that through knitting, one can harness the potential to utilise inner peace to subdue our personal capacity for violence. The exhibition is in a fantastic space: several rooms under the eaves of a wing of the museum, each leading off a central corridor. One is invited to stroll through and browse, with huge lengths of knitting entangled with barbed wire suspended above. The exhibition opens with a short film of one of Cirkus Cirkör’s shows, a wonderful acrobatic piece whereby knitting is integral to the scenography. This is striking use of the craft that really explores the boundaries of knitted fabric, done out in maximum with hugely thick thread and massive stitches. Set pieces were highly sculptural and embodied movement, perfectly suited to use in a circus. Upon leaving this room, the visitor is introduced to the main scope of the rest of the exhibition, which was a collaborative project. Cirkus Cirkör put out a call for pieces of white knitting to be sent in that considered the question, 'Is it possible to knit peace?' 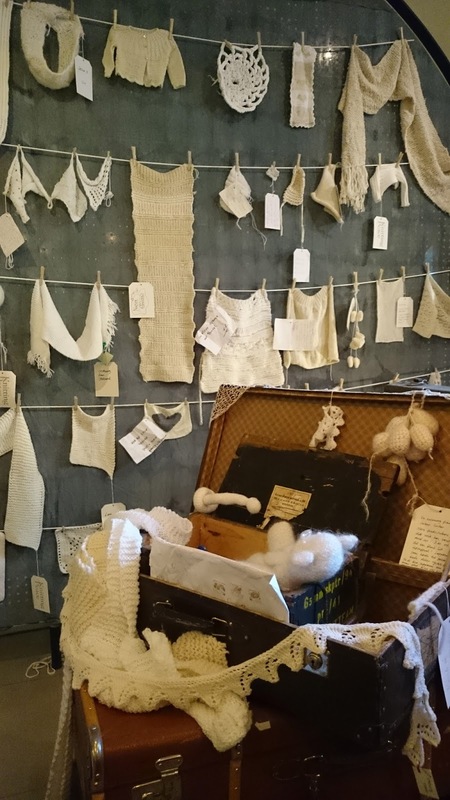 Participants donated a range of objects, from elaborate shawls to toys and patches of white, and all were labelled with a luggage tag explaining their thoughts on how knitting creates peace. These objects were displayed on the walls of the exhibition rooms, and arranged into tableaux such as a dining table and teatime set. Finally, the third theme was craftivism, which suggests a context for the installation. A photographic display of yarn bombing and public textile art around the world was included as the backdrop to some of the rooms. These tableaux and props were humorous and fun, again utilising medium of knitting as a form of sculpture, and taking it out of its usual, more domestic context. However, the installation rooms did not really reinforce the circus acts hinted at, and seemed more to be a way of displaying the donated objects. The craftivism exhibition included some truly exciting pieces, but the photographic reproductions were rather small, and did not do the work justice. The sheer mass of the white knitted donations took over the exhibition, and although all contained personal messages, they did not successfully unite in pushing a thesis; they were highly individual, and not really political. Which is rather odd, considering they were in a museum dedicated to war. The textile artists featured who combined activism with their medium created some of the most provocative and thought-provoking pieces in the exhibition, such as Lisa Anne Auerbach's Body Count Mittens. The knitting workshops at Farsta refugee camps also seemed like a lovely idea, to create cold-weather garments together and create a sense of community. However, these projects were displayed on very small placards in a corner at the back of the exhibition. It is a real shame that they weren't given more prominence. Overall, I feel the exhibition was too ambitious in scope. It did not really succeed in arguing its thesis: that knitting can bring peace. Or perhaps the kind of peace specified was not clear enough. Inner peace can certainly arise through knitting, as studies on the meditative qualities of craft attest. But the peace gained here seems far removed from a warzone, and in its location of the Army Museum, and the context of war, knitting as peacegiver seems rather vapid; as evidenced by the hyperreality of a knitted net smothering a tank in the museum's entrance place. 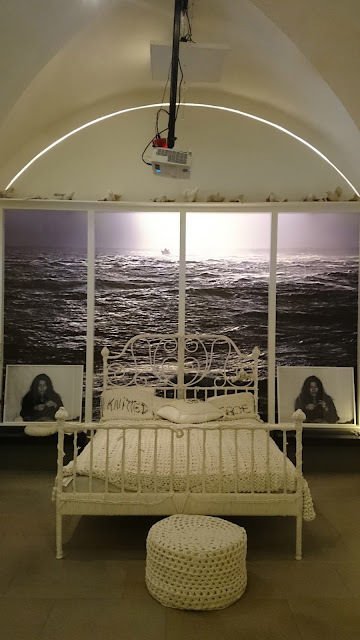 This idealistic sense of what peace could be makes the most sense in the room featuring a knitted take-over of John Lennon and Yoko Ono's bed-in. I would have liked the exhibition to be far more insightful, and to share more personal stories of craft and transformation. To be more effective, it should have made us question our privileged Western/Northern European lives far more and at the very least find stories from those caught in the cross-fire, not just those of us living far away in safety. Attacks on refugee camps by far right groups are a major threat to Sweden's peace, alongside its cultural sensibility of justice, democracy and fair-play. Can knitting help solve that problem? I'm not really so sure. 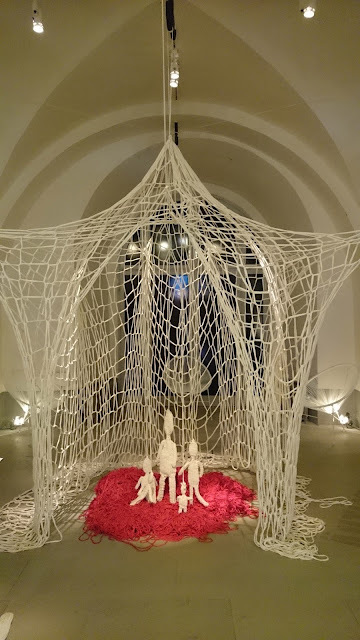 Knitting Peace runs at Armé Museum, Stockholm until 30 November.